1. A bachelor’s degree in any field from a recognized college or university. For MBA in Health Program, a bachelor’s degree preferably in medical or allied fields. Other fields may also be admitted subject to the decision of the Program Director. 2. A general weighted average of 85%, B, 2.0, or its equivalent. For MBA Standard Program, at least two years after graduation. Supervisory experience is an advantage. For MBA Middle Managers Program and the Ateneo-Regis MBA Program, at least five years and supervisory/managerial experience is required. Applicants without supervisory/managerial experience but have more than five years of significant work/professional experience may apply subject to the evaluation of the Admissions Committee. Similarly, applicants with less than five years work experience but currently occupy a supervisory/managerial position may also apply subject to the same procedure. For MBA in Health Program, at least five years in a middle/upper middle management position in the healthcare industry. 4. A satisfactory score in the AGSB Entrance Examination. 5. A fully accomplished Online Application Form. 6. Pass the interview as may be required by the Admissions Committee after the entrance examination. For MBA in Health Program, an interview is required by the Program Director. Students from other Universities, Schools, or Colleges may transfer and be admitted into the MBA program following the same admission standards and requirements as those with Filipino and foreign Applicants. Transfer students may be given credit for courses already taken subject to the evaluation of the Dean. Students from other Universities, Schools, or Colleges may enroll for certain courses in AGSB. And due to the transitory nature of the study of specific courses, as mandated by the sending school, some requirements for admission are waived, except for the accomplishment of the Online Application Form and submission of Transcript of Record. Additionally, the Applicant must also submit Course Descriptions from his/her current school, and Endorsement by their Dean. Applications of cross-enrolling students are processed by the Office of the Registrar. 1. If the Applicant in enrolling as a non-degree student but plans to pursue an MBA degree in the future, he/she must fulfill the standard admission requirements as those with Filipino and foreign Applicants. 2. If the Applicant desires “audit” status only for courses without any intention to pursue a degree in the future, he/she is exempted from the major requirements of the program. However, he/she must still accomplish the Online Application Form and submit an original Transcript of Records indicating graduation with at least a bachelor’s degree. 3. All students enrolled on non-degree or audit basis must still be bona fide college graduates. Official Transcript of Records (OTR) of bachelor and/or post-graduate degrees. Original Certificate of General Weighted Average (GWA), Quality Point Index (QPI), Grade Point Average (GPA) or its equivalent, if not reflected on the OTR. Copy of Grading System or Grade Equivalence certified by the duly-authorized school/university official, if not incorporated on the OTR. For an overview regarding Academic Grading in the Philippines, click here. Recent passport sized color ID pictures – 2 pieces. Photocopy of Birth Certificate. Bring the original NSO/PSA copy for verification. Photocopy of Marriage Certificate. Bring the original NSO/PSA copy for verification. Photocopy of Passport, if one of the parents is not a Filipino. Bring the original for verification. Duly-accomplished Recommendation Forms from your current/previous employer and school/university. Two recommendations must be submitted in a duly-sealed envelope. To download the forms, click here. *Note: To ensure that The Ateneo Graduate School of Business (AGSB) conducts fair and thorough evaluations of all its applicants to various degree programs, processing of applications will only commence once all valid documentary requirements are submitted to the Office of the Registrar. Authenticated copy of academic records (Transcript of Record) of bachelor and/or post graduate degrees, translated into English. Original Certificate of General Weighted Average (GWA), Quality Point Index (QPI), Grade Point Average (GPA) or its equivalent, if not reflected on the Transcript of Record. Photocopy of Birth Certificate. Original document must be presented. Photocopy of Marriage Certificate. Original document must be presented. Photocopy of Passport with visa stamp. Original document must be presented. Duly-accomplish Recommendation Forms from your current/previous employer and school/university. Two recommendations must be submitted in a duly-sealed envelope. To download the forms, click here. 1. Accomplish the Online Application Form. Upon submission, take note of the Applicant Identification Number that will appear (e.g.,1-2013A12345). This will serve as your Temporary ID Number for accessing your Online Account. 2. Personally submit complete and valid** requirements at the Office of the Registrar at least 3 weeks before the desired Schedule of Entrance Examination. Submission through a representative is not allowed. ** Note: The Office of the Registrar will conduct an initial evaluation by reviewing your Online application and documents submitted. Evaluation cannot commence until all requirements have been complied with. Thus, incomplete/invalid documents will not be accepted for processing as it will impede the entire evaluation process and will affect other applicants. The schedule of application processing are as follows: Monday thru Friday from 12:00 PM to 6:30 PM and Saturday from 8:30 AM to 1:30 PM. 3. Pay the Application Fee when advised by the Office of the Registrar. 4. Get the Entrance Exam Permit by presenting the Official Receipt at the Office of the Registrar. 5. Take the Entrance Exam. Note: For cancellation or re-scheduling, submit a formal request to the Office of the Registrar at least a week prior the exam schedule, stating your reason and attach supporting documents and your Exam Permit. Your request will be subject to evaluation and approval by the Office of the Registrar. 6. Wait for the result of your application for admission 4-5 weeks from date of exam. It will be emailed to you by the Office of Registrar. The Entrance Examination is usually scheduled twice a month all year round. The Applicant may select a schedule of exam from the AGSB Website. On the day of the examination, the applicant must present the Entrance Examination Permit issued by the Office of the Registrar before being allowed to take the Entrance Examination. The Permit must have a recent photograph of the applicant attached to it. To maintain ther integrity of the examination, this procedure is followed strictly and the Exam Proctor is instructed to disallow applicants who do not follow this rule from taking the examination. The Graduate Management Admissions Council (GMAC) , owner and administrator of the Graduate Management Admission Test® (GMAT®) exam is now here in the Philippines. 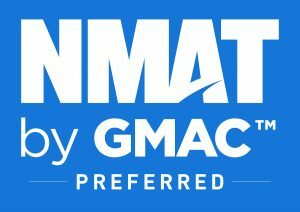 It recently launched its NMAT by GMAC™ exam which enables schools to recruit top talents. Ateneo GSB is a preferred learning partner and shall serve as the official testing center of the internationally- administered NMAT by GMAC. 1. Create an account on nmat.org. 6. As a special offer, Exam Fee will be refunded to your first term’s tuition fee when you enroll here at the Ateneo GSB.